Following her Grammy-winning effort of ES FACIL AMAR, Lani Hall virtually retired from the music business, with only an occasional guest effort on her husband’s recordings. In 1998, more than a decade later, and without the benefit of her husband owning a record company (Herb and Jerry Moss had sold A&M to PolyGram in 1989), Lani signed with the Windham Hill Jazz label to produce a single album. 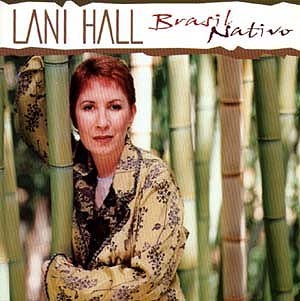 Titled BRASIL NATIVO, this one again placed Lani in the Brazilian music setting that launched her career. Essentially an album with three main players, BRASIL NATIVO also featured numerous appearances by Herb Alpert on trumpet, and Dori Caymmi on guitar and vocals. Eddie Del Barrio is also present with arrangements and other musical duties, and is thanked first in the liner notes, thus appearing that he may have been the driving force on getting the album done. The track list is a mixture of the familiar and the not-so familiar, with Lani covering some previous ground in spots. It’s an understated album with a number of more dramatic readings of some songs than we’re used to. “Mas Que Nada”, instead of a sprightly samba, is performed in a slow, dirge-like fashion, as is “Waters Of March”.